Yesterday was a cheat-day. I had spent all day scrambling around, running errands and catching up on other chores. 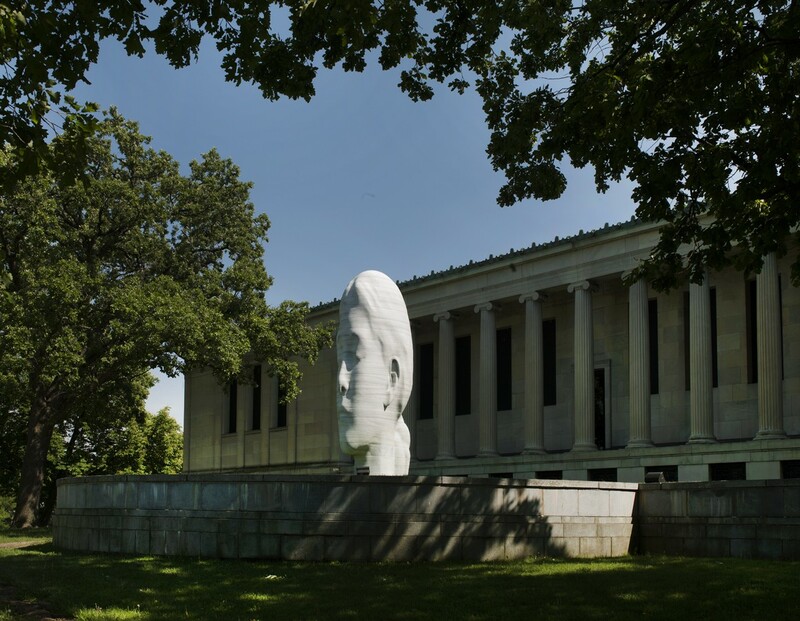 I didn’t get a chance to sit down and really work on a post; as a matter of fact, I didn’t sit down at all, except for an hour during the talk by artist Jaume Plensa at Albright Knox art gallery. The picture above shows his work installed outside the gallery- Laura (here’s an article on the sculpture from Buffalo Rising)- and the picture is taken from the internet. Getting back to subject on hand, I had such a busy day yesterday that if not for the challenge of publishing something every single day through the month of November, I wouldn’t have bothered writing anything at all. Today, I simply want to critique my post from yesterday, from an outside point of view, and as objectively as possible. To be clear, I don’t already have an opinion, it’s one of those things that falls in the realm of ‘gray’ for me. But those are the kind of things that provoke the deepest thought, and here’s a bunch of them 😛. So at the end of my one-paragraph post yesterday I mentioned fighting ‘a good fight’. When it comes to publishing something on your own blog, what is considered ‘a good fight’? There are no pre-requisites to a valid blog post- I could have just as well posted a photograph or an old poem from my collection. Would it then be any different than writing just one paragraph? A blog is whatever the blogger wants it to be. In my particular case, I want this to be a chronicle of my life- my thoughts and opinions, my successes and failures, day-to-day highs and lows, and the wisdom that comes with all of that- my lessons, as I call them. I did share a lesson yesterday, in fewer words than I would normally use, but the lesson was to never give up. If someone disqualifies me, I’ll accept it, but as far as I am aware, there are no rules to be broken here! Here’s a football analogy, my first, and probably the last too 😉 I do love the sport but hey, it’s a sport, it doesn’t inspire elegant thought! Anyway, pressing on then… When a receiver isn’t sure whether the pass is complete, and the referee hasn’t blown the whistle, he still runs all the way if he can. Because in the event that all else is fair, he will end up with a touchdown. But if he doesn’t even run to the end zone, the point is moot, it’s simply a compete or an incomplete pass with no reward in either eventuality; reward in this case being points on the board. So I took the ball just as my clock was burning down to zero and I ran with it. I am calling it a touchdown because I didn’t break any salient rules. But what about the not-so-conspicuous rules? What about the implied rules instead of the expressed ones? What about the integrity and quality of my work? Over the last one month, I have set a standard for myself in all that I have written. People who follow me have, in turn, come to expect that same standard from me. To put just one paragraph out there, simply to check a box, seems unfair in an idealistic world that is elevated above tangible, and to be quite honest, inconsequential accomplishments. But being a new blogger, a challenge like this is instrumental in reinforcing the habit of ‘blogging’, hence the excitement. Yet, was yesterday an example of blogging or simply making the cut? I did the bare-minimum, and I’ve never had much appreciation for those who coast through life doing just the bare-minimum. It is infuriating! I may have managed to preserve my spot in the challenge but a successful completion may already be considered spurious, because while completion is black and white, success is not. Then again, it’s simply National Blog Posting Month, not National SUCCESSFUL Blog Posting Month. I would revisit yesterday’s post at a later time when I am able to talk about my current predicament, because although on the surface yesterday’s message seemed to address the rather plain subject of posting something, it was really the embodiment of everything I am going through right now. Right now, I am in the middle of the biggest fight that I’ve ever had to put up in my life, and I am not giving up so long as I am still breathing! Time isn’t really on my side, but I’m fighting a good fight and it’ll soon be over, and I’ll soon be able to write about it. I’m certainly not beating myself up for yesterday, just trying to argue it from both sides. I’m glad I posted something, but at the same time, it didn’t seem enough! If you look at other blogs though, some people write even less than your post yesterday, or post inspirational quotes or things like that. But what you said is interesting for this discussion-you said “my musings”. Which means those musings can be whatever you want it to be! Thanks for the compliment. I do try to really focus on how things look and flow. Before August of this year I wrote really long blogs so I especially felt I had to do that to make it work. Did this lyric work here..where should I put the song clip here, does this photo work here type of thing. Now I have scaled them back and it is a little bit easier but I still try to make it all work. I’m glad to hear that is how you feel about them, makes it worthwhile :-). Lets put it this way, it was fun doing it, and crossing it off my blog achievement list, but….I don’t think I will be doing that EVER again lol.